Would you like us to send you a catalog of what we offer? Sign up for a free catalog of our custom handmade logo mugs. Perfect for your Coffee Shop! Marketing your coffee shop with custom coffee mugs can be an easy way for you to demonstrate your shop’s association with quality. Happy guests can take home a custom branded mug to remind them of their great visit and share their experience with family and friends. Our customers love that our Handmade pottery mugs are made here smack dab in heart of the Midwest USA. We were stared back in 1972 – over 40 years ago! Over 24 pairs of hands touch each mug through the production process. Although amazingly uniform, no two mugs are exactly the same–each piece is as unique as your coffee shop. 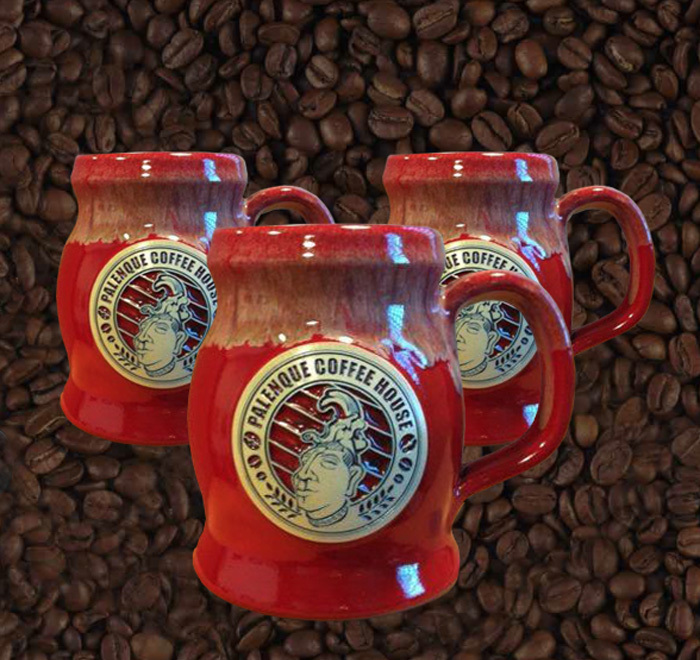 Deneen Pottery has partnered with many coffee shops to create mugs that represent the high quality and unique flavors and of each establishment. When happy guests purchase a mug, it provides more than just extra revenue, it creates a conversation piece with co-workers and friends so they can easily and frequently share their positive reviews. Today’s coffee shop industry is tremendously competitive, meaning owners have to do everything in their power to stand out from other stores in the area. According to the U.S. Small Business Development Center, the U.S. coffee shop industry contained more than 22,000 stores as of 2016, with a combined annual revenue of $12 billion, and an expectation to reach more than $46 billion by 2021. With the sharp increase in cafes in recent years, coffee shops need to set themselves apart – but how? The answer may be custom coffee mugs. Below are 20 ways a coffee shop can distinguish themselves by using custom coffee mugs. Everyone loves to support their favorite brands, which includes coffee shops. Give them a way to show their love by selling custom coffee mugs with your business logo on the front. Hand-tossed pottery can make a big impact your crowd and give you a unique way to show off your business. Every time someone uses your mug, your coffee shop will enjoy a little bit of exposure. Use your mugs for patrons who are enjoying their coffee in-store. Not only will this get them drinking out of the mug and experiencing the quality first-hand, it’s a more sustainable option over paper cups. If you’re feeling generous, host a special in-store giveaway to get a boost of traffic through the door. People love free stuff, so get them interested in your brand by giving them what they want. Use Facebook Ads to target people who like coffee and related interests, within the appropriate demographics. You can get hyper-targeted on Facebook, making it a valuable tool. With the branded mug as the central image, you’ll attract more eyes to your ad. Instagram, the photo sharing social media app, is a powerful tool for marketing your brand. Post images of the mugs to encourage fans to come in and try out your java. Offer a discount program for those coffee drinkers who bring in their mug. Frequent visitors will be happy to save a little cash, while still enjoying their favorite cup of joe from their favorite mug. Pinterest has a very targeted audience, whose users are interested in gorgeous photos of unique items. Create an account and start Pinning your mugs and others that you see to spread awareness of your items. While this may go without saying, unique memorabilia sells faster than something that’s been done before. Sometimes successful marketing is as simple as creating a striking logo that draws eyes and raises intrigue and placing it on your items to spread awareness. Once you’ve found your distinct and appealing logo, reach out to a custom mug company to get them developed and to start selling them at your store. The use of high-quality images in your marketing and advertising will create a more powerful effect. Take some professional shots of your custom coffee mug, filled with delicious, steaming coffee. The aesthetic of your advertisements should make them crave what it is you offer. If your coffee shop is lucky enough to have foot traffic outside the shop, slowing customers down with free samples is a great way to introduce them to the store and product. Offer the samples out of your mugs so people can experience the quality first hand. Plus, you get the added benefit of word of mouth marketing. First impressions make a huge difference, and visual appeal is incredibly important to drawing in and retaining customers. Use mugs as a decorative item throughout your store. The visual appeal of your shop will catch the attention of all the people who walk through your door. Gift baskets make great presents – especially around the holidays. Craft some creative gift baskets that includes a branded mug, a few bags of your coffee beans, creamer and sugar, and other coffee-related items. People will be glad they don’t have to buy each thing individually. Whether a bean supplier or a local gift shop, try to pinpoint opportunities where you can work with a partner. They can offer your mugs for sale on their shelves, while also exposing your brand to their customers. You scratch their back, they’ll scratch yours! Use email marketing to get the word out about your new, unique memorabilia. Use a email marketing program like MailChimp to easily build out emails with templates and other automated features. Just don’t be pushy – you don’t want to come off as a spammy marketer. It’s your duty as a business owner to put the customer first. Nothing turns a good experience into a bad one like a coffee shop acting selfishly. The number one goal of a coffee shop should be to make a customer happy, and that extra effort will go a long way in positive word of mouth marketing. Using custom coffee mugs to craft a perfect drinking experience will aid your efforts. News about your coffee shop doesn’t just start with customers. Influential bloggers in the area can start the buzz if shops give them an exceptional experience. 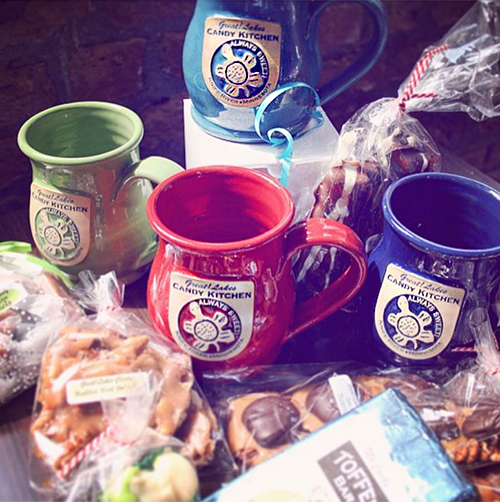 Send them a mug as a gift and entice them to come in and review your coffee shop. Giving them something upfront also ensures that the relationship gets off on the right foot. Instead of stock footage or images in your advertisements, take professional photos of your mugs and use them throughout your assets. This creates a consistent theme of imagery that consumers can connect with and remember. Hopefully they’ll be so drawn-in by the aesthetic that they’ll come in and see your store themselves! Take some snaps of your mugs or customers enjoying your coffee and send it out to your followers. If you’re targeting millennials, this is the best platform to reach them – 71% of Snapchat users are under 34 years old. 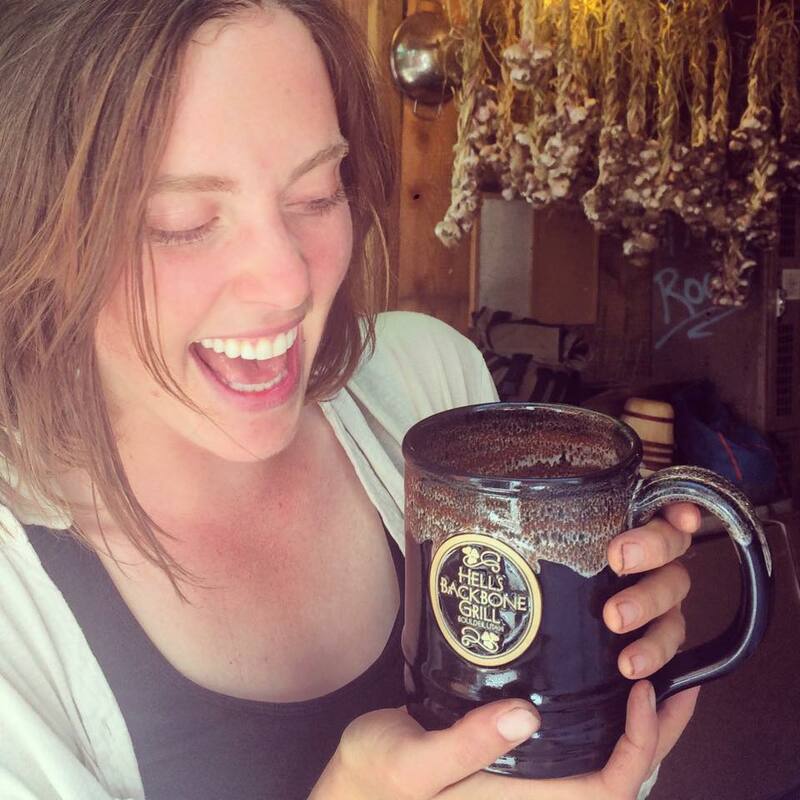 Mug clubs encourage interaction and help develop a community around your products. Hang up the mugs of your proud members around the shop and give them a discount whenever they order a cup of joe. Advertise your Twitter handle around your store and encourage people to follow your account. Tweet out discounts and deals to mug club members who are always looking for another reason to visit your shop! Sharing expert knowledge is a perfect way for independent coffee shops to differentiate themselves from big box coffee stores. Educating customers in person or through a company blog can help coffee shops earn customers interested in learning more about coffee. Slip in some sales copy into your blogs to promote your mugs – or develop an entire article series about why custom coffee mugs are the best. When it comes down to it, using coffee mugs to market your coffee shop is a great way to spread the word about your delicious beverages, warm atmosphere and sustainable business. Gripping a beautifully crafted ceramic mug will only make your customers feel more important, and help preserve their cup of joe to stay warm and fresh. You can always customize your own ceramic cup with Deneen Pottery’s signature line of coffee mugs that come in a wide variety of color glazes or handles that best suit your own unique style. Contact us today to get started! We're looking forward to connecting with you personally!